Home Can You Have Too Many Deer? Can You Have Too Many Deer? Several states are fighting the battle of controlling their herds without overharvesting. What’s the optimum level of deer population? 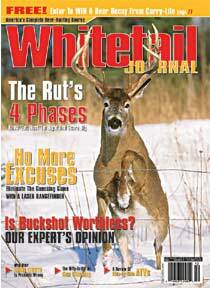 Over the past fifty years whitetail populations have grown dramatically. In the 50s, 60s and 70s, deer numbers were relatively low, so game agencies touted “bucks-only” hunting to protect the herd. “No doe hunting” was the order of the day, and that approach worked. In the 1980s, deer numbers started to escalate. By the 90s they were at all-time highs. The population explosion seems great on the surface. After all, hunters were seeing thirty or more deer a day. What could be better? In essence, though, the effect of all those deer was devastating to forests. Though this damage was obvious to ecologists and wildlife biologists, it wasn’t obvious to hunters at the time, and it still isn’t today. Oak regeneration was severely limited in some areas. In much of Eastern forests, native wild flowers have completely disappeared and preferred plants and tree species are decreasing. Consider that in my home state of West Virginia, deer are browsing ginseng to the extent that this wild herb is decreasing by 6 percent per year. That’s an obvious pathway to extinction. At the same time deer numbers were exploding; we saw the rapid spread of chronic wasting disease (CWD), and high deer densities were linked to that spread. For years hunters had been told not to shoot does, and they were hesitant when game agencies proposed adding additional seasons, lengthening others and increasing doe bag limits. These proposals resulted in higher doe harvests, but still the herds grew. In the early 2000s, Pennsylvania undertook a major management program that would dramatically increase doe harvests while also implementing a statewide antler restriction. Doe harvests went up, but within two years, hunters who had become accustomed to seeing many deer were screaming mad. Today many Pennsylvania deer hunters feel that the deer herd has been lowered to a “recreational threshold.” This is defined as a deer density at which many hunters do not see enough deer to justify continuing to hunt. Wildlife biologists Ben Moyer and Bryon Shissler of Pennsylvania recently wrote about the recreational threshhold and pointed out that in states such as New Hampshire or Maine, deer numbers and harvests are much lower than those in Pennsylvania, yet complaints are few. In Pennsylvania, some hunters have stopped hunting and many thousands are complaining because they aren’t seeing enough deer. Similar hunter complaints are coming from Michigan and Wisconsin, where doe harvests have also been increased. Things have gotten so bad in Pennsylvania that hunting organizations have filed lawsuits against the state wildlife agency to lower doe harvests. One only needs to establish a fenced deer exclosure to see the impacts of deer browsing on the forest floor. Over a short period of years, plant diversity inside a deer exclosure explodes, while little growth occurs outside. Research from various parts of the country shows that forested habitats are in trouble. It’s true in Pennsylvania, West Virginia, New Jersey, Michigan, Wisconsin and parts of many other states. One aspect of this problem is exemplified by a Coopers Rock State Forest near Morgantown, W.V. That forest has been tremendously overbrowsed by deer. We know that forested habitats should only have 20-25 deer per square mile. At such densities, forests are healthy and deer are, too. There is no data for Coopers Rock, but my guess is that it only holds ten deer or fewer per square mile. With a few inches of snow on the ground, it’s possible to see several hundred yards in this forest, because there is so little ground cover. Few thickets, little food and little cover for deer — deer numbers are low because the habitat is so beat up. Local hunters get angry because they feel that the DNR has allowed the over-harvest of deer in that state forest. In truth, too many deer have denuded the food resource. Even though deer numbers are low, they are still too high for available forage, and the forest suffers. What is needed on this forest is even lower deer numbers, so that over a period of 10 years or so, the forest can return and browse species regenerate. Only then can we expect deer numbers to rise. However, that might not be possible anywhere. Research done in Pennsylvania shows that today’s hunters have trouble harvesting enough deer in forested habitats even when deer numbers are in the 20-per-square-mile range. Whether this is because of lower hunting skills or less inclination to hunt far from roads is open to speculation. But it is happening. Thus, it is doubtful that my local hunters can kill more deer when deer numbers are already low. Have we overharvested does in some local areas? Sure. But the above comments still describe an all-to-common scenario. What this has meant for state game agencies is more political interference stimulated by disgruntled hunters. 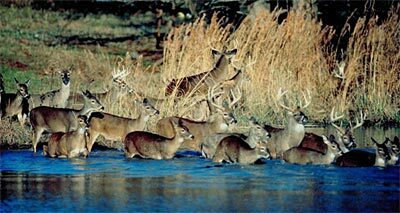 Politicians and hunters question state deer-population estimates. Politicians also threaten budget cuts, and such coercion causes state agencies to back off on doe harvests. Sadly, continued ecological deterioration of wildlife habitat is the result. The solution lies somewhere in the middle with more deer than the forests can stand, yet lower than the high levels we saw in the 1990s.